Aw this is so great. I have two autisic brothers, one 18, and one 7. It's such a great way to raise awareness and it ths most amazing use of the technique i've ever seen. Wonderful job. This pattern could could easily be adapted to make an afghan and also a tote bag. that is insane! In a good way, but still. wow you must have a lot of patience. I am totally showing this to my friend whose son is autistic. You get a "this rocks"
Really it's great job, "this rocks". 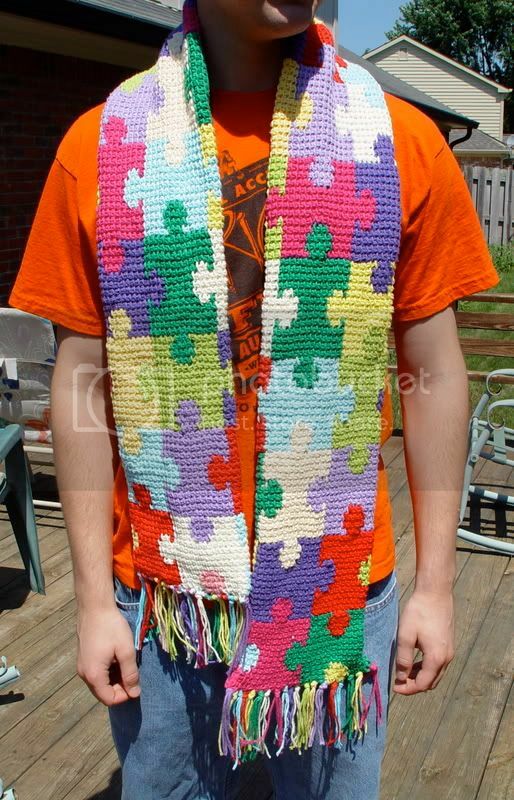 I made a scarf with the same pattern and wanted to add some photos of it here too. 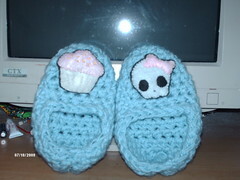 I used sugar n cream all cotton yarn so it's bulky and toasty. My son is modeling it for me. It's made the same tunisian stitch way following the graph only this time I only made it 4 puzzle pieces wide and 16 puzzle pieces long. This way you join the sides and they match up in back where the joining seam is. This is a front and back shot. (Sorry the back shot is over-exposed). I wanted to show the seam. 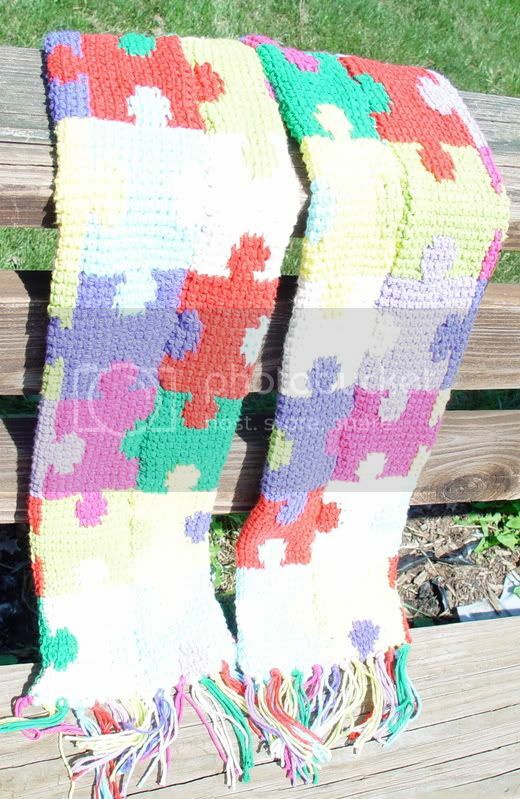 Just make sure you use the correct matching colors while working on it so when you join the sides, the end puzzle pieces will match in color. wow thats all i can say is wow!! Beverooni says, "Happiness is a hook in one hand and yarn in the other." 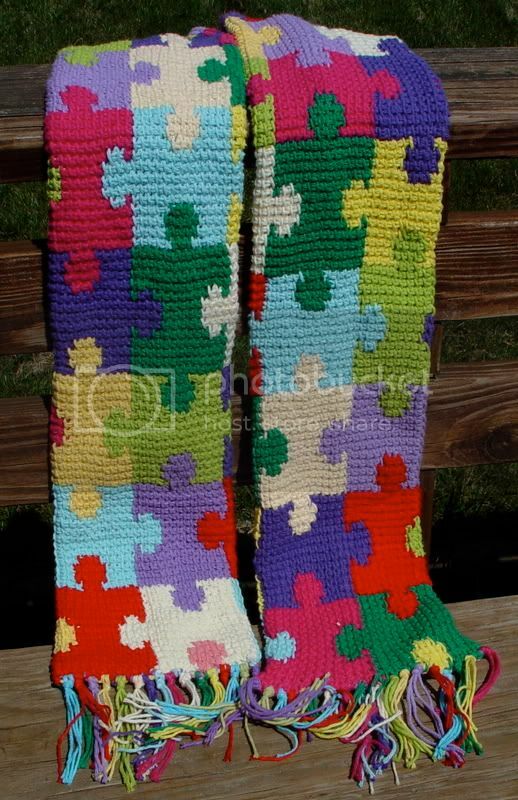 I would LOVE to make this for a woman I know who has 2 twin boys, both autistic. She helped me out with my Christmas gift to my parents this year since I have no money and I think this would be a beautiful way to pay her back.